Dale Spaulding, a senior studying communication, has several passions. He’s been podcasting for five years, and he also loves editing, writing and reading. One thing he listens to frequently is audiobooks, but he noticed that they have shortcomings. One of the biggest shortcomings is the length. Most audiobooks are several hours long. Spaulding said it’s frustrating for students to listen to audiobooks only to be interrupted when they go into class. 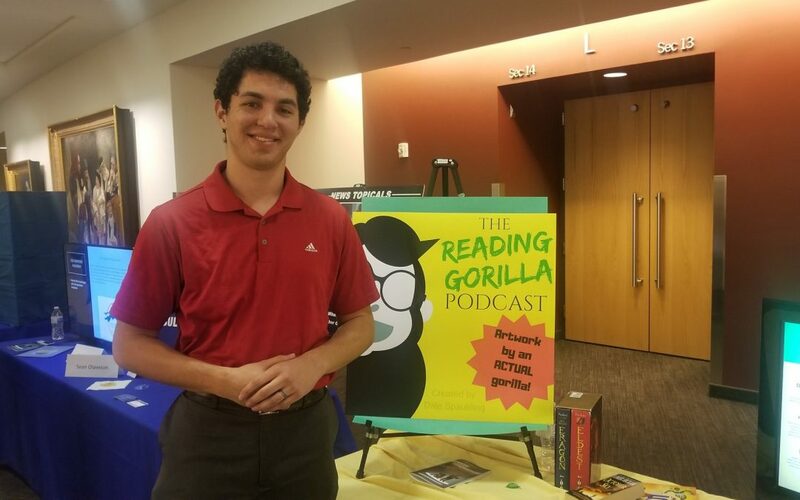 Spaulding started The Reading Gorilla Podcast in September, with short stories being told on the podcast. He said the purpose of the podcast was to “help people listen to high quality short stories on a time crunch.” Spaulding highlighted the work of the podcast at Senior Showcase put on by the BYU-Idaho Department of Communication. For Spaulding, the driving force in starting the podcast was to deliver Harry Potter or Eragon caliber storytelling in an easy format that people can listen to and enjoy. Through an online service, Spaulding has made his podcast available on all major podcasting websites. A typical podcast consists of four or five stories being told; other stories are released individually. Spaulding said networking has played a big part in the podcast’s development . “It started out with talking to people face to face,” Spaulding said. Since then, he’s developed a survey that prospective writers can fill out to help him assess what stories they can contribute to the podcast.